As some of you know, I am a needlework contributor over at 30 Handmade Days. 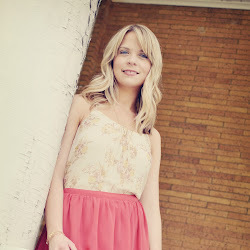 I figured while I am doing some behind the scenes work I would share my older 30 days embroidery guest posts with you. They are posts from the last 4 months or so, which is why the projects aren't necessarily seasonally appropriate. Regardless, I hope you enjoy! So far, we have covered getting started, the back stitch, and the chain stitch and today we are going to cover the stem stitch. Admittedly, it is not one of my favorites, but it does come in handy especially for curved lines. It has a pretty rope like look and adds a nice texture to your stitching. I have seen the stem stitch done a few different ways, but I am going to show you how I do it. 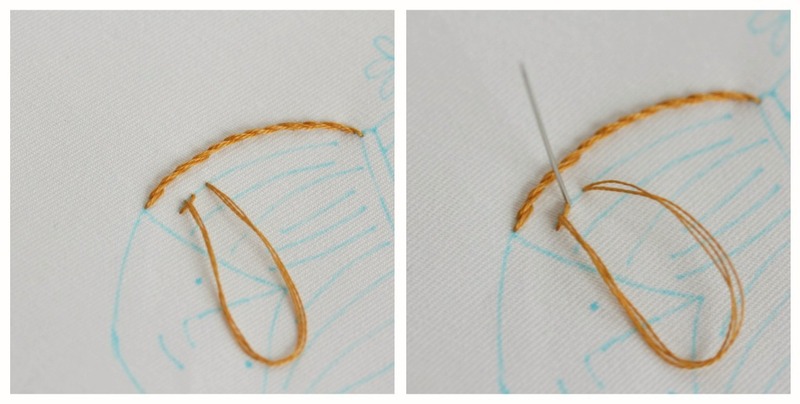 At the end of the post, I will link to a couple other tutorials for this stitch. We all learn differently, so there is a chance that something that doesn't work for me might work for you. Bring your needle up through point a and down through point b, but don't pull your thread all the way through just yet. Keeping your thread below your needle, bring your needle back up between point a and point b. Pull the thread though, but don't pull too tight. 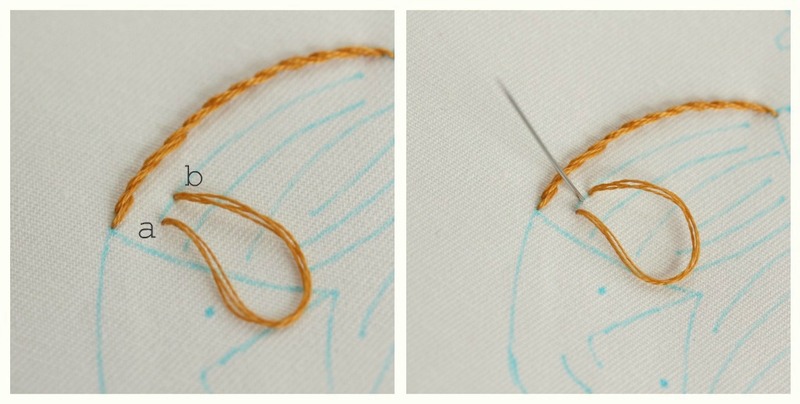 Put your needle down through a stitch length away, but don't pull your thread through yet. 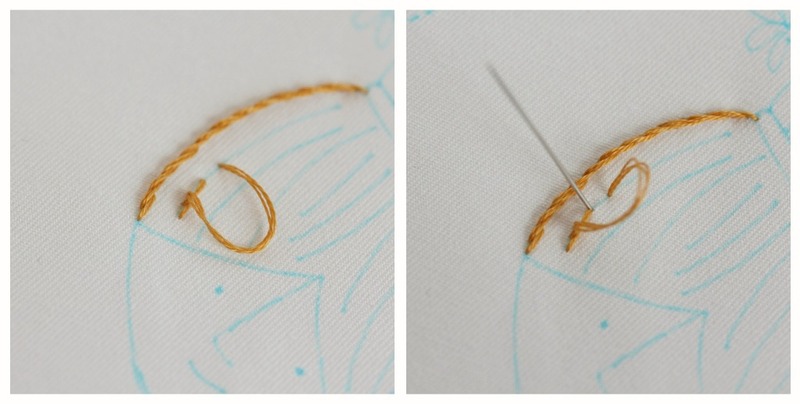 Making sure to keep your thread below your needle, bring your needle up through the end of the previous stitch. Pull the stitch through. 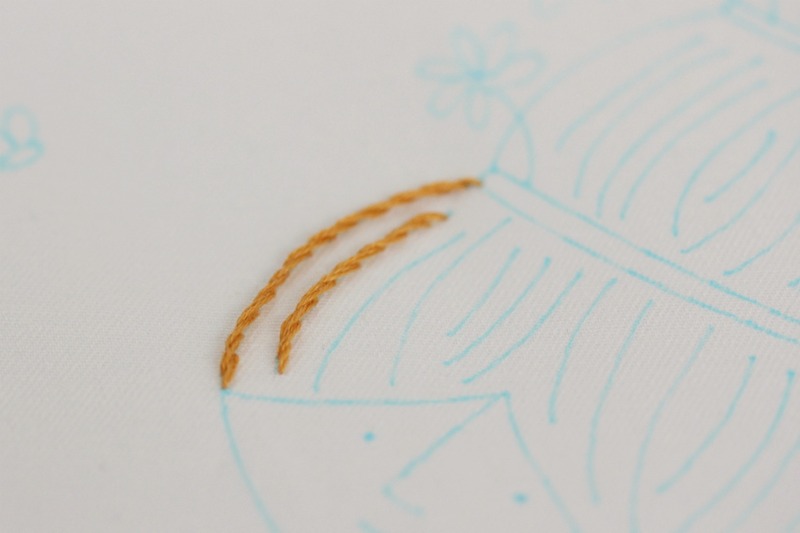 Repeat the two steps above until you have reached the end of your stitching. In case you were wondering, the pattern I am working on is Betty's Beehive by Shiny Happy World. Cute! Like I promised, here are a couple different methods for this stitch: Wild Olive shares a couple of different methods (and her pictures put mine to shame!). Coats and Clark has a drawing that might be helpful. If you need to see it in action, this youtube video by Make It Mine magazine is a good one. If you have any questions - ask away! I would love to help. I love the patterns from Shiny Happy World! Great post!! Thank you for sharing these! I am awful at stitching but you are motivating me to give it another try! Did you see my post, lol. I'm practicing what you're teaching! I have had an embroidery machine for years, but they have really had too small a throat area to accurately quilt a quilt. For fine bobbin thread I HEARTILY recommend Bottom Line by Superior. This was recommended many years ago when I first started using an embroidery machine, and now the selection of colors etc is fantastic. I it is the only bobbin thread I use.